That an awesome feeling! I've been out hanging deer stands, plowing and seeding food plots and slinging some arrows at my 3D targets. September 8th can't get here soon enough! Not sure what to think about the one with the dirty hind legs. Either he was in a oil well sludge pit or had a potty accident. I am guessing that death ray loosened him up a tad. I confess I have missed way more coyotes than I have hit. They always show up when I least expect them. One trotted out in the road as I was closing the gate to go home one day and all I had was a 22 magnum pistol on me. I started shooting at it (nine shots) and the guy that was with me was laughing so hard I lost it. I even reloaded got a couple more off and finally got ran out in the road and got a ricochet that sent it running. Damn thing must have been deaf, or was when I got through. My dad trapped them for spending money when he was a kid. Boy if PETA knew what he did to them to hide his scent they would croak. 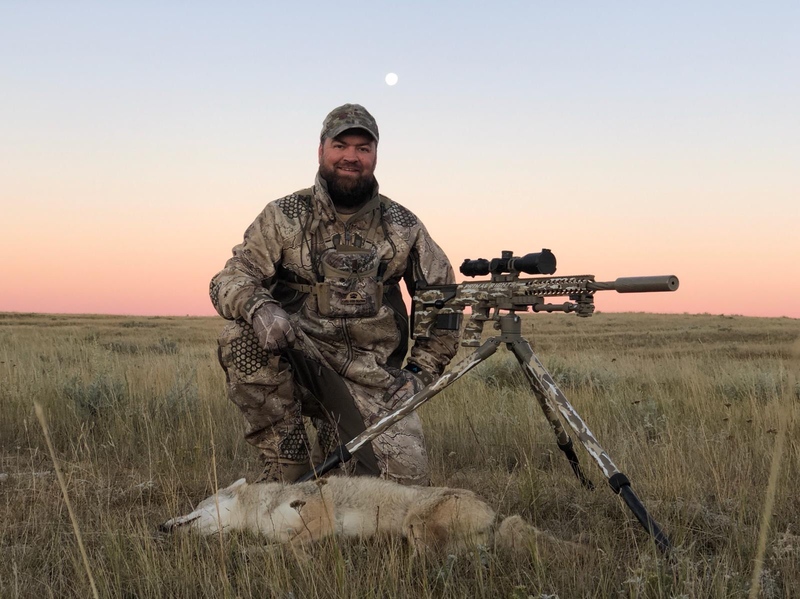 So I was very blessed with the opportunity to hunt coyotes with @orkan this last week. It was a very fun and exciting week. I arrived at the coyote cabin on Friday evening about 2-3 hours before sunset. We quickly gathered up our gear and headed out. The first couple of sets we didn't see anything, but we were mostly using these sets so that I could get used to how to use the gear and how to set up for each set. After those sets we were easing farther up a valley when we suddenly heard a rattle in the knee high grass we were walking in. We slowly backed away and let him have his space and walked around another way. On the next set we watched about half a dozen mule deer walking around and getting ready to bed down for the night. Close to sunset we heard several coyotes and saw one, but they were not interested in coming to see what we were offering that evening. 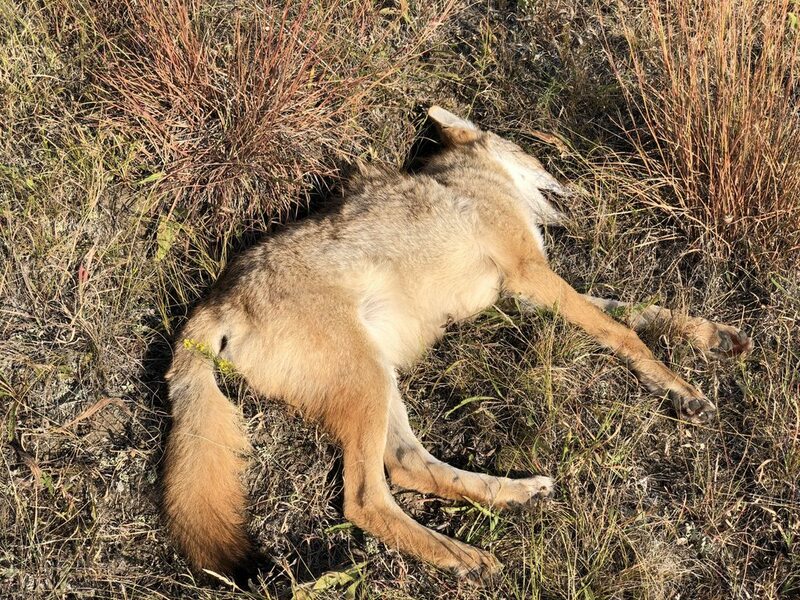 The next day was very warm which as I learned from Greg is not great for coyote hunting. We decided that instead we would shoot prairie dogs. We drove to a field that had prairie dog mounds for about as far as was visible and began shooting them. 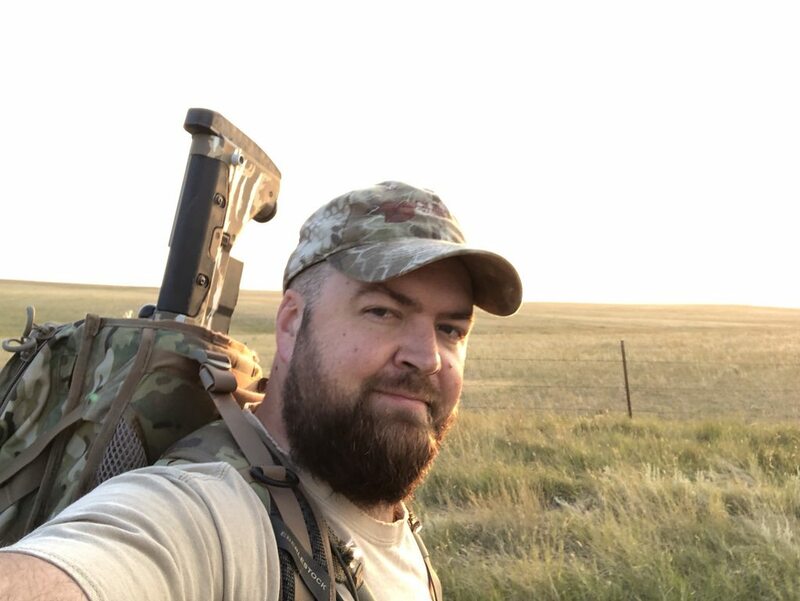 It was during this time that I became very thankful for each and every piece that was on my rifle. The Desert Tech preformed as very well as expected. The Tangent Theta 315P worked flawlessly even when I was very quickly turning the dials between targets. Due to lack of practice, I was getting lost in the reticle, so instead I started dialing for every target. 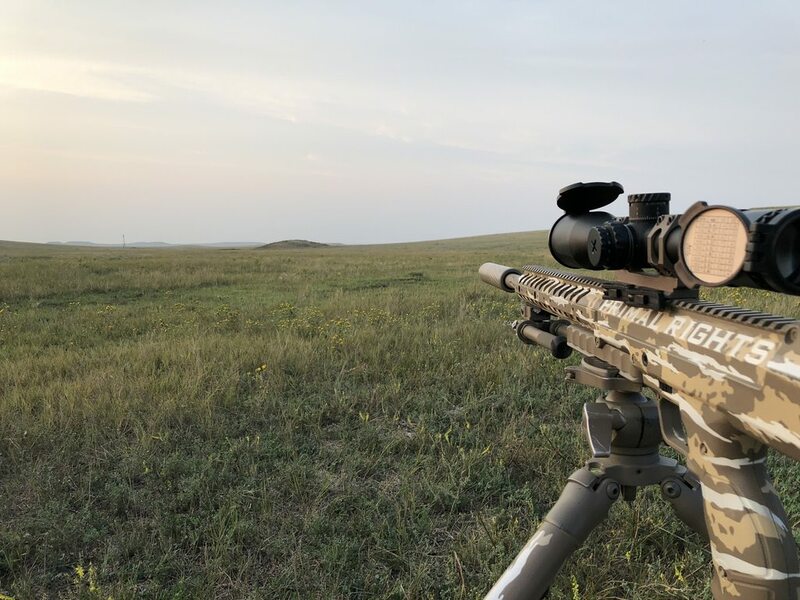 The 22cm worked amazingly well both for shooting long range and the immediate destruction of the prairie dogs. 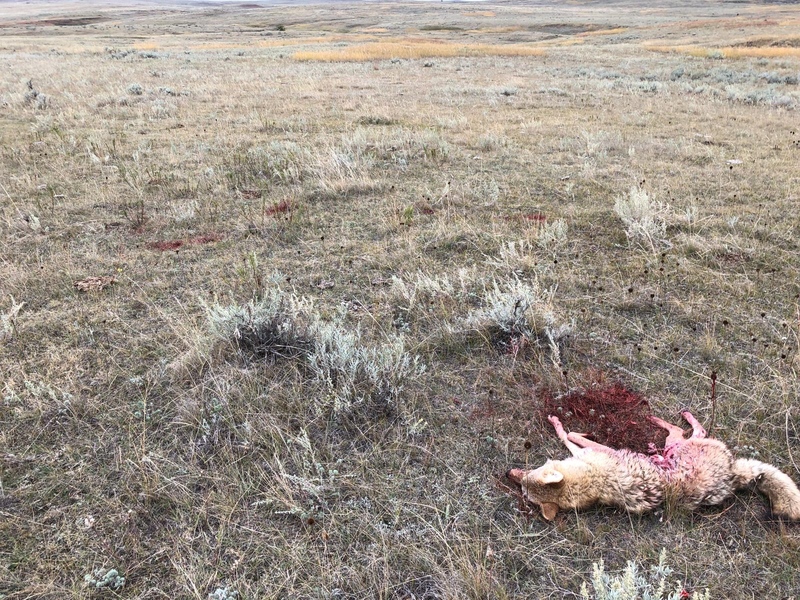 The first target was 168 yards and the prairie dog "popped" as the 80gr berger literally ripped him apart. I gradually worked out to distance with Greg calling the range from his Vectronix. 205, 272, 341-- all first round hits with ease. When we got out beyond 400 I began having trouble hitting again. Greg asked if I was computing a solution for each distance he called out...and I was not. I had a chart I was looking at with ups for every 100 yards and I was estimating off of that chart. I got out my kestrel elite with AB and began plugging in the distance for each target and once again began hitting almost every time. 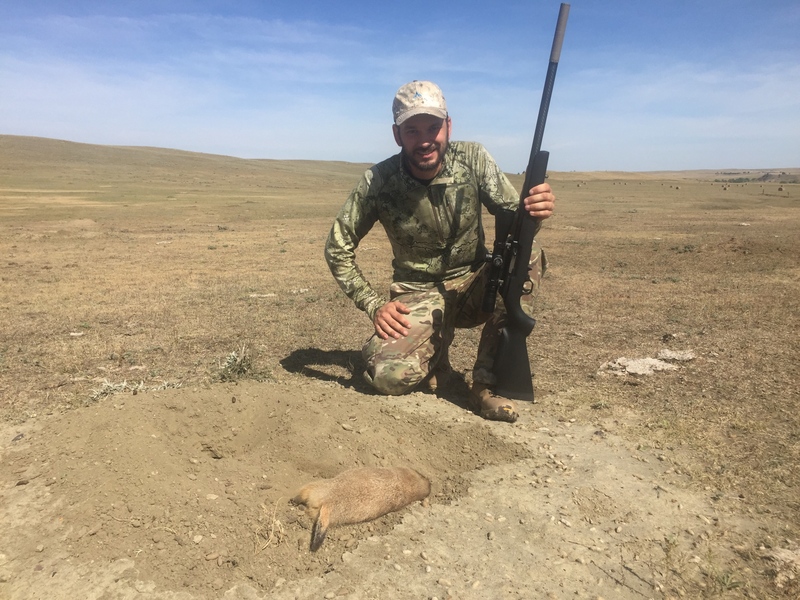 At 485 I shot two prairie dog with one shot. Somewhere around the 400-500 yard mark, one of the prairie dogs did a cartwheel about 2-3 feet in the air when the Berger hit him. We continued to work on out and at about 600 the wind became a larger factor. It was blowing about 10-15 mph from left to right and would also lay down to almost nothing at times. I got hits at 650 ish, then 680, then we stepped out to the 900's. The difference between 970 and 980 was almost two tenths of a mil on a target where one tenth was enough for a clean miss. 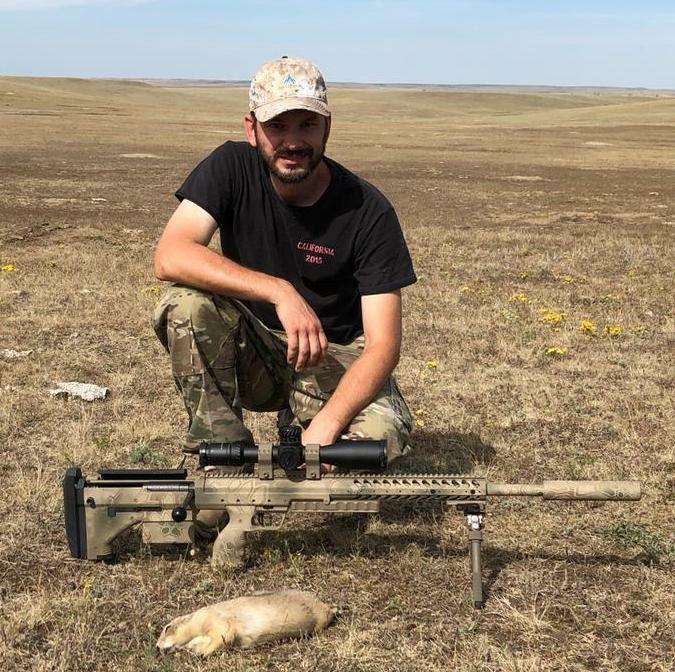 My farthest kill for the day was at 980 yards on the prairie dog pictured below. After my 22cm barrel heated up to the point that I didn't want to shoot it any more, we pulled out the Volquartsen 17 WSM. That rifle was a blast. 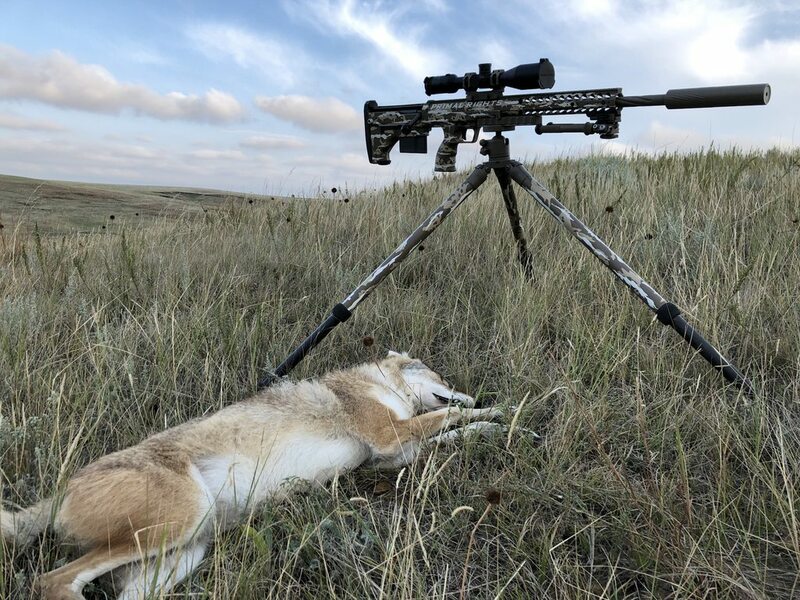 Anything inside 200 yards this rifle would shoot with authority and had 8 rounds in the mag for quick followups on any multiples that ventured to stick their head out of the hole. This rifle had no problem inflicting the damage necessary either. This rifle was a lot of fun to shoot and is a great rifle for anything in a similar size range. I watched as Greg shot one after another at 100+ yards while free standing...including what he called a "gopher" (I would have called it a chipmunk). The next day was colder so we headed out on some coyote sets again. 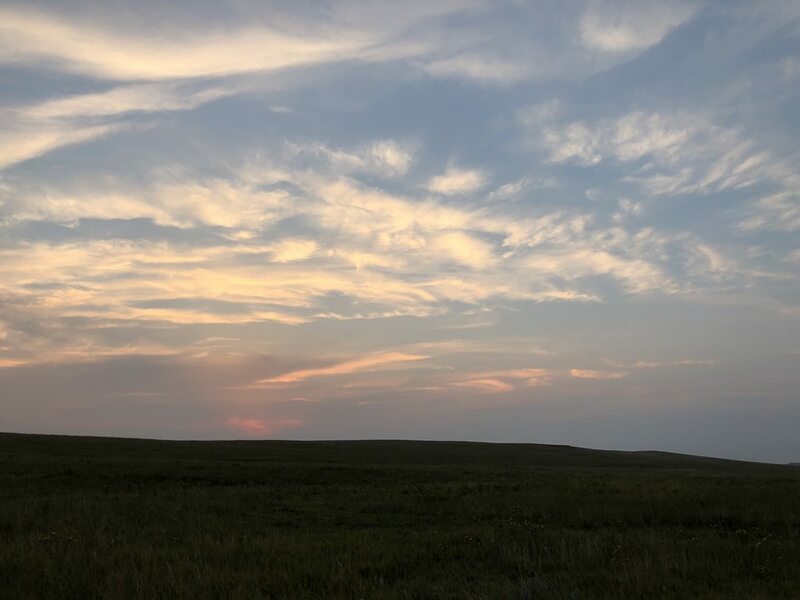 The first few were quiet only seeing Antelope and deer and this quietness as well as the vast openness that I am not used to lulled me into a trance. We were on the fourth or so set of the day sitting on a slight hill looking down into a valley. It was about 150 yards to the bottom of the valley, then about 375 to the top of the next hill, and about 650 to the next rise, and the horizon was probably well over a mile in the distance. The vast openness is hard to comprehend without being there. I was watching the hill at about 375 thinking that nothing would get closer than that without me seeing it. I was in somewhat of a trance when Greg whispered, "do you see it?". See what? There wasn't anything there? I scanned the hilltop frantically trying to lock in on the coyote that must be there and I saw nothing. Greg then whispered, "get on your rifle and find him in your scope". I'm still frantically looking and thinking "find what in my scope? I can't even see it." I glance back and forth quickly once again when suddenly I spot movement. He was very close at this point. I swing the rifle the few degrees necessary and he pops his head up and looks straight at me. Greg says again, "you got him?" and I say "yes". Greg says, "shoot"...so I quickly squeeze the trigger as I well know that the coyote is about to run. 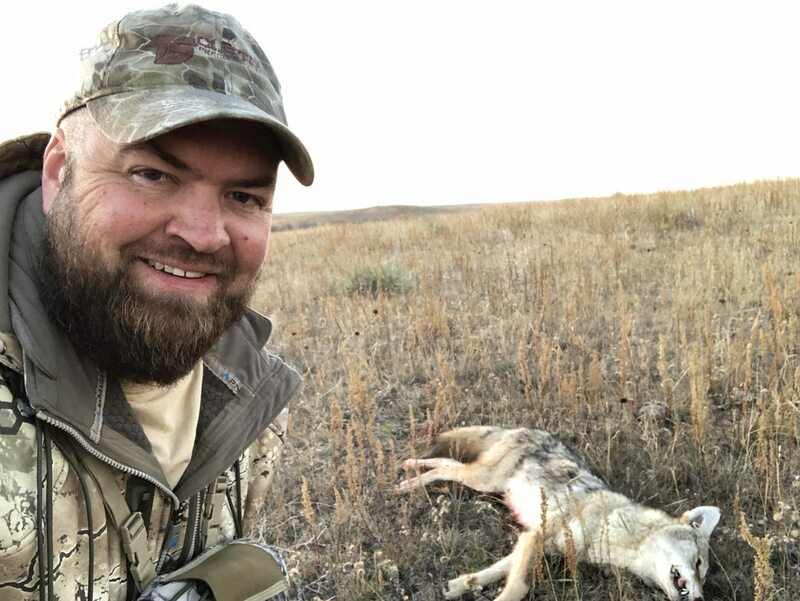 This coyote ranged out at 51 yards when I finally saw and shot it. 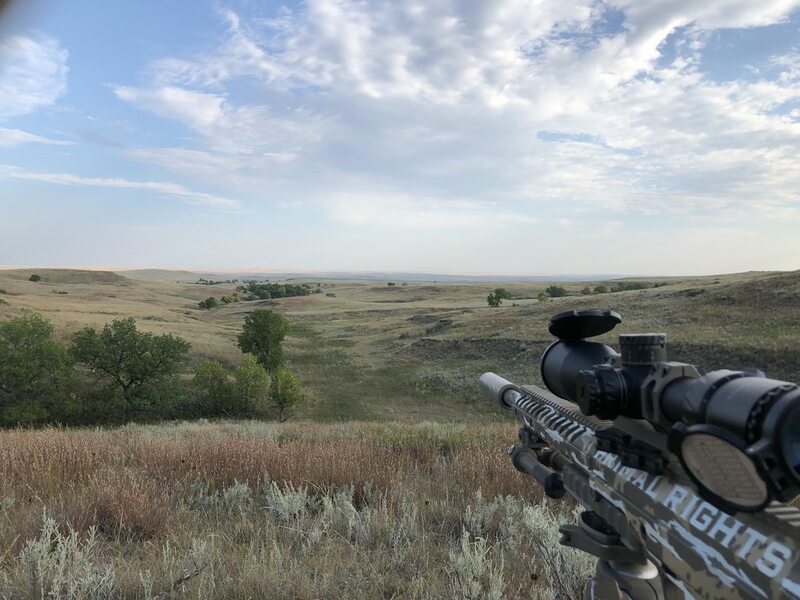 It had walked right in front of me at 120 ish yards while the whole time I was looking at the more distant hills. 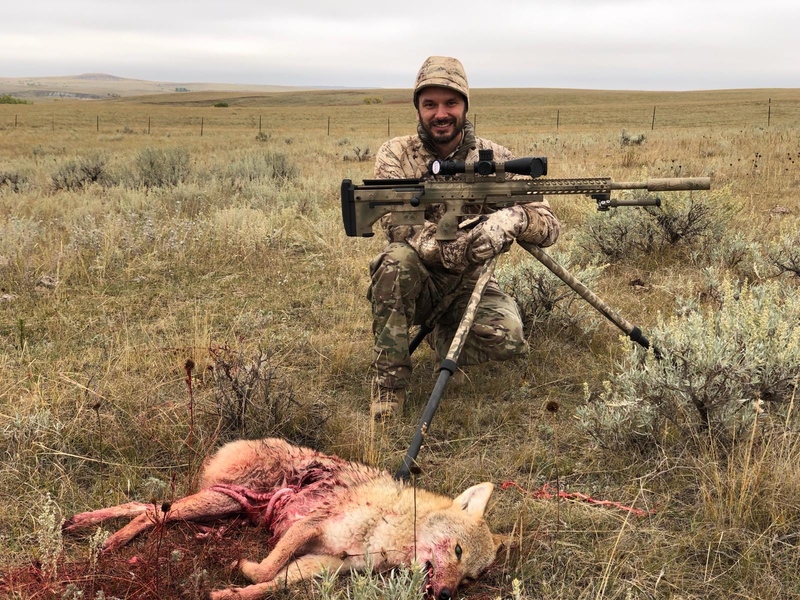 Due to the hurried shot, I hit him a little farther back than I should have, but the 22cm and berger did what it was supposed to and still allowed for a solid kill. After this we laid low for a couple of days due to high wind and intermittent rain. We got in a couple of sets, but not many due to the weather. 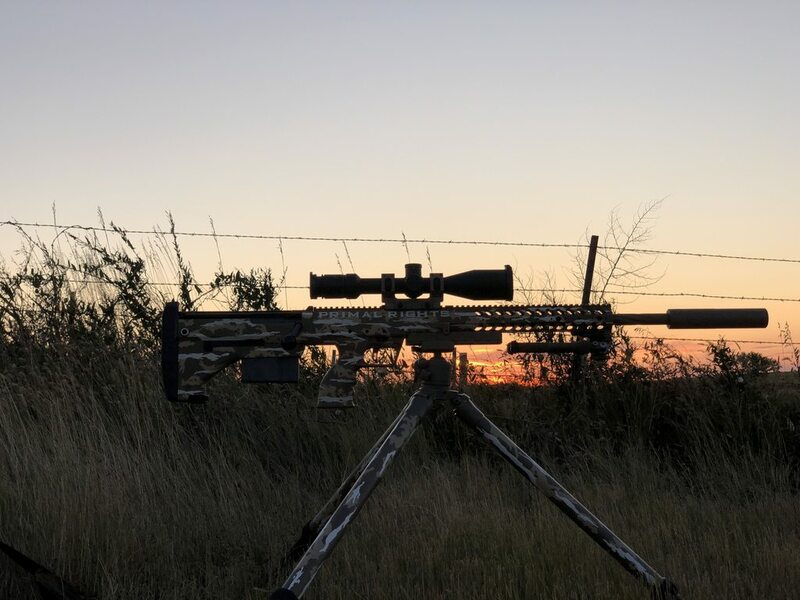 On one of these sets close to sunset we saw a whitetail doe at about 275 yards. It walked across the field in front of us and then started walking down the field row that we were sitting on. We both sat very still just watching and waiting. It meandered up slowly closing the distance. 200 yards, 175 yards, 100 yards, 50 yards. At about 10 yards it walked right in front of us looking at us, then proceeded on to within about 6 yards of us. At that point she crossed where we walked in and took off. Both this doe and the coyote at 51 yards both show that our camo was working. We got one more decent morning of hunting in where the weather cooperated. First set of the morning we get sat down and get our rifles out. 2-3 minutes into calling one pops out and is almost down wind of us. 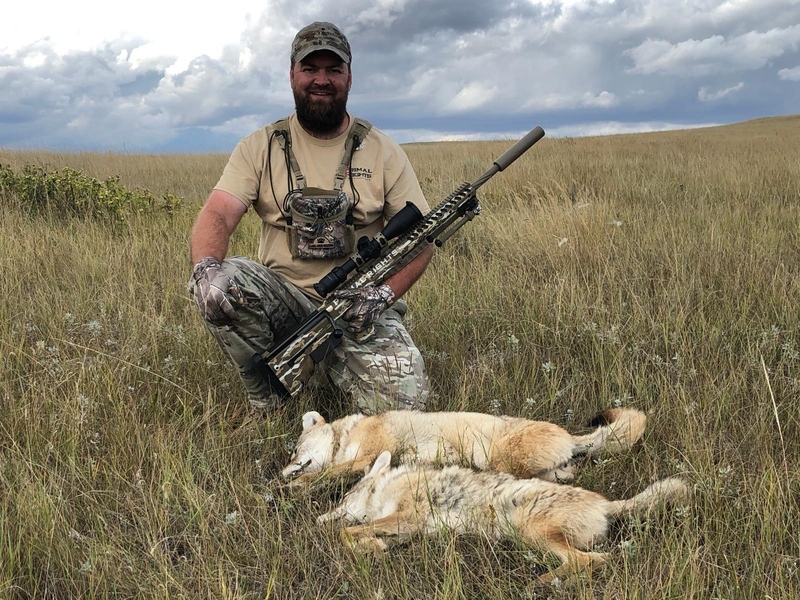 it was at about 200 ish yards, but was not going to be coming any closer as either our scent was bothering him or it had seen us. This one was directly on the other side of Greg from me and when it started walking away, he quickly shot it and put it down immediately. It was a beautiful morning with a great sunrise. Overall I had a wonderful week. The weather presented some trouble a few days, but we still managed to see quite a bit of game. 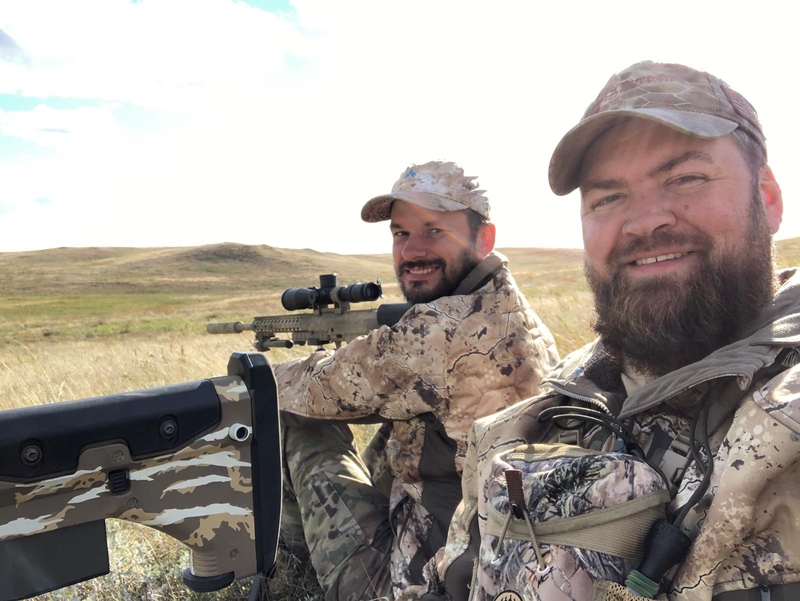 I would guess we saw around 50 pronghorns and 50 mule deer each day. Most of them could care less that we were around and almost ignored us. The terrain is quite different than the hills of Tennessee. I am even familiar with the plains of Mississippi, but this is even more vast than the flat plains. 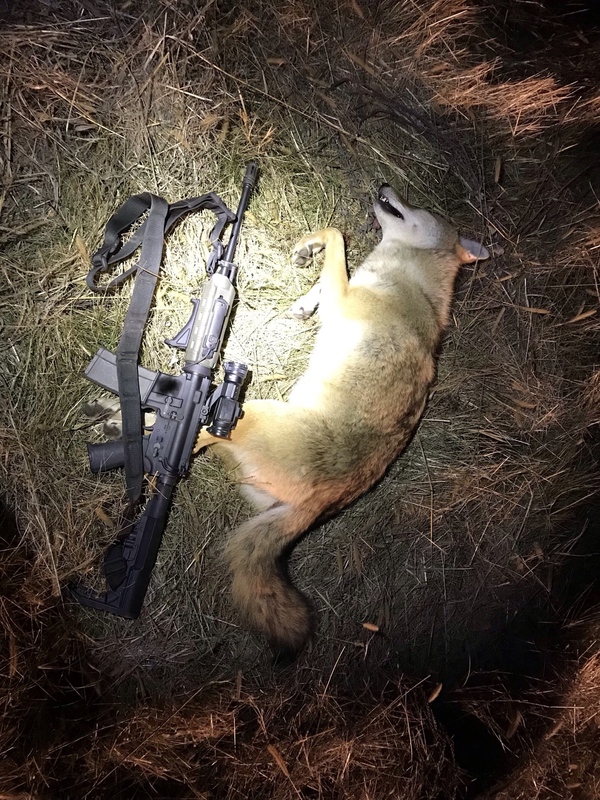 I had a lot of fun and intend to take what I learned and kill some coyotes back here in Tennessee! This trip has revealed very quickly why Greg recommends the equipment he does. I could not have done what I did this last week with lesser equipment. As much as I like the 525P, I am convinced that for hunting the 315P is all that would ever be necessary. 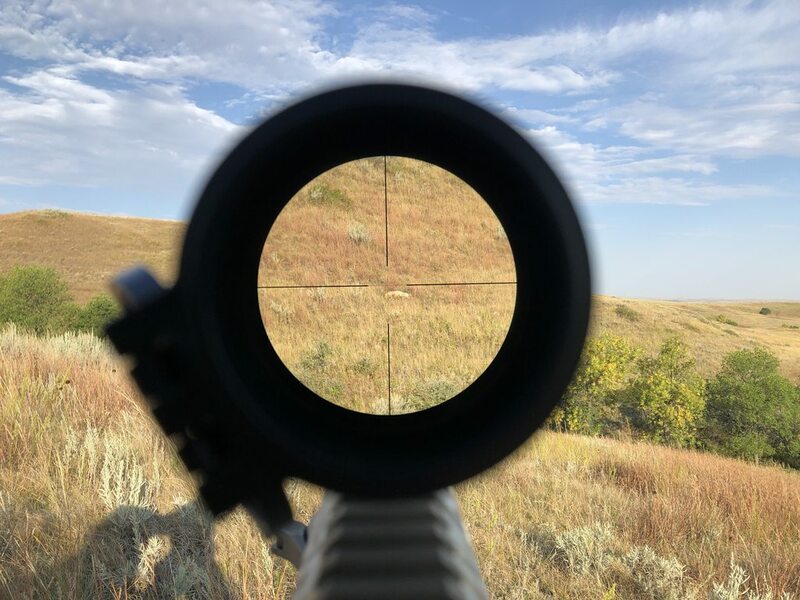 If I was able to see clear enough to get a kill on a prairie dog at 980 yards, then it should be sufficient for any other game that one might hunt. I am also sold on the 22cm round. I liked it before I left for this trip, but after using it for coyote and prairie dogs and seeing how effective it is, I am completely sold. I am convinced that I will have a 22cm barrel for as long as I own a Desert Tech rifle. Great write up @dddoo7 I got the pleasure of seeing some of these pictures as @orkan texted me some of them but the stories behind them make them that much better. 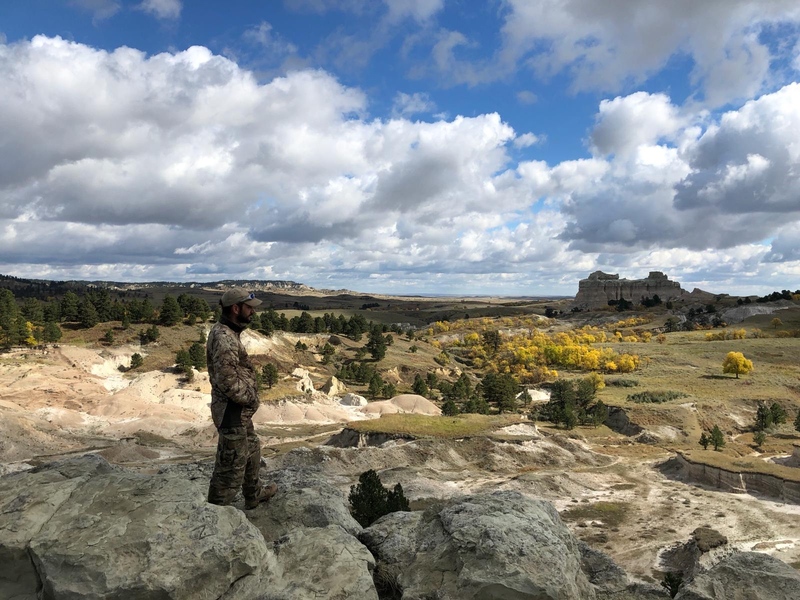 And yes, you literally can't put it into words how vast it is out there and you don't see another human, vehicle, or structure for seemingly as far as you can see. It is truly one of the most beautiful places I've ever seen. Glad you had a great time! Information overload and system shock are real things when dealing with this big country. That is an awesome write up . That 22 CM destroyed that coyote. @curt1521 Pelt damage is about 50/50 with the 22 creed. If you hit them solid in the shoulder, it tends to be minimal. If you hit them a bit too far back, they about get ripped in half. Either way, they are dead as disco. 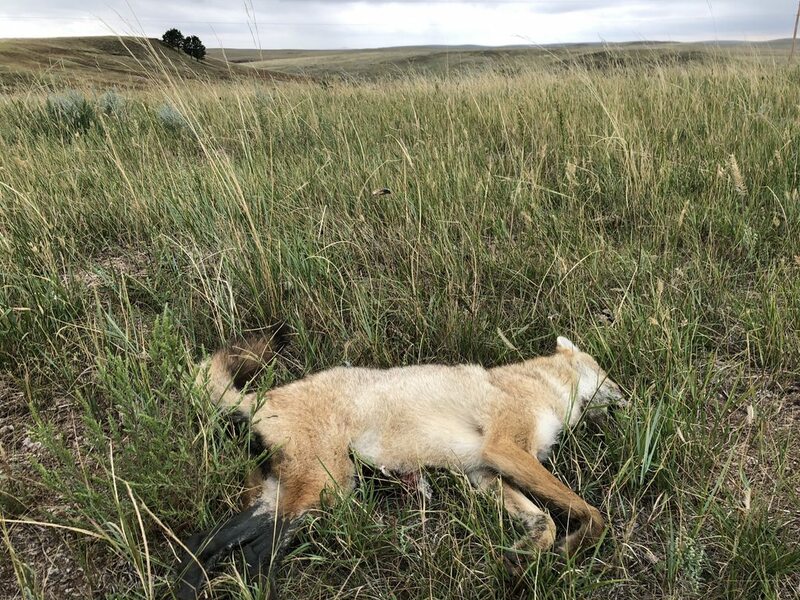 At 50yds, that coyote got hit with a touch over 2000 ft/lbs. I’ve seen 6 coyotes in the tractor this year during harvest. Shot one (I feel like it was a good shot it stumbled but ran into the corn and we never found it) missed two, haven’t been able to get a shot off at a few others. So I might get a picture in here sometime. Surprised we’ve only seen one raccoon, and the rabbits are everywhere again. Saw 4 more tonight (3 including this on) definitely not a monster, they were all about this size tonight. @kea If you missed him he would have droped from a heart attack with all that lead flying at him.Sounds like a-lot of fun.